The other night I was looking around for recipes involving rosemary. My rosemary plant flourished this summer and I wanted to do some stuff with it. 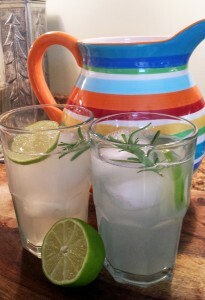 I happened upon this rosemary lemonade recipe, which looked delightful, but I didn’t have any lemons. I did, however, have a rather large bag of limes sitting on my kitchen counter, waiting for me. So I decided, “Why not make a new twist on this thing and make rosemary limeade?” That’s exactly what I did. But here’s the thing…the hubster and I are on Weight Watchers right now, trying to drop a few pounds and get super healthy. So because I didn’t want to use the sugar and have to count points for this tasty little treat, I swapped out the sugar for Splenda, making this a delightful, zero-point beverage. 1. Get a bunch of limes and some Splenda (clearly, from Costco) and cut a few sprigs from the rosemary plant. 2. Add Splenda to water and heat, toss in the rosemary, wait a little bit, then turn off the heat and let the water cool. This is your “rosemary simple syrup”. 3. Using a juicer, squish your limes until you have enough lime juice. 4. Pour water and lime juice into pitcher, add rosemary simple syrup, stir. Pour into glass over ice, garnish with lime slice and rosemary sprig. Enjoy. First of all, yum. It’s really good and it’s super-refreshing. If you want to use real sugar, it’s a 1:1 swap. You can toss a couple of the smooshed limes in your garbage disposal and run it for a minute or two to clean and deodorize. DON’T use bottled lime juice. It will be terrible. 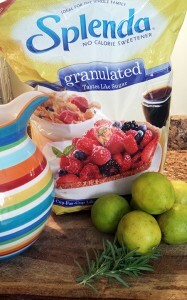 In a small pot combine 1 1/2 cups water with 1 cup Splenda. Cook over medium heat and stir to dissolve the Splenda (with Splenda, this will happen almost immediately. If you're using sugar, it will take longer to dissolve). Once the Splenda has dissolved toss in a sprig of rosemary and wait until the water is steaming hot. Turn off the heat and all the mixture to sit in the pot until the water has cooled. 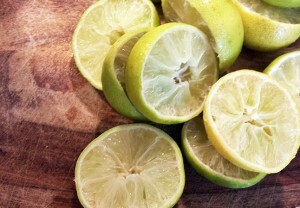 Extract the juice from 5-6 limes (you want one cup of lime juice). 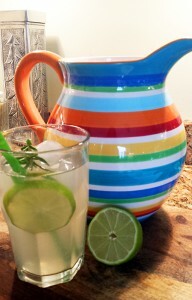 In a pitcher combine 4 1/2 cold water, lime juice, and your sweetened, rosemary-infused water. Serve over ice, garnished with a lime slice and a small rosemary sprig.